Brown beef ribs in large nonstick skillet over medium-high heat until browned on all sides, turning frequently. Meanwhile, in 4 to 6-quart slow cooker, layer onion, tomato, carrots, potatoes and garlic. Spoon browned beef into slow cooker. Drain off any fat from skillet; add wine, 1/2 cup of the water and bouillon to skillet. Cook over medium heat until mixture comes to a boil, stirring occasionally. Sprinkle beef with salt, thyme, basil and pepper. Pour hot wine mixture over beef. Cover; cook on low setting for 8 to 10 hours. About 15 minutes before serving, with slotted spoon, remove beef and vegetables from slow cooker; place in serving bowl. Skim off fat from cooking juices in slow cooker. In 4-cup glass measuring cup or medium bowl, blend remaining 1/2 cup water and flour until smooth. Pour juices from slow cooker into flour mixture; mix well. Microwave on HIGH for 3 to 4 minutes or until mixture boils, stirring once halfway through cooking. Pour sauce over beef and vegetables. 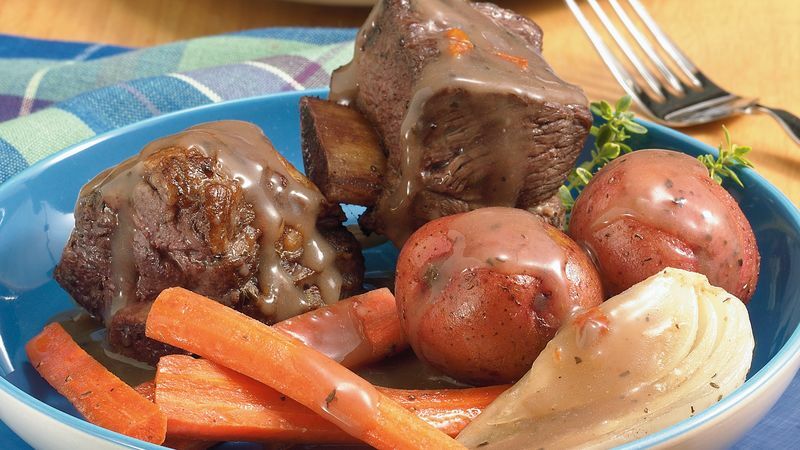 Short ribs are trimmed from narrow beef rib and short plate sections. Small and square, short ribs are layers of meat and fat with pieces of rib bone. They are flavorful but tough; long, slow, moist cooking tenderizes them. Use a kitchen scissors to snip sun-dried tomatoes into strips; spritz the blades with nonstick cooking spray so the tomatoes won’t stick. Browning and draining the short ribs before continuing to cook them removes some of the fat. Use several layers of paper towels to blot the fat from the surface of the cooking juices before adding the thickeners, or skim off the fat with a ladle. For a crisp salad, combine lettuce, apple slices and walnuts, and serve with blue cheese dressing.